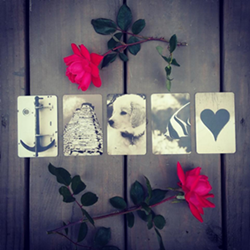 Shuffle your cards, asking them to reveal the three muckiest parts of your life. When you're finished shuffling, turn the deck over and deal the bottom three cards. 1. 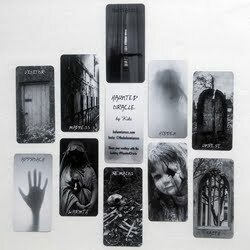 The Bottom Card - (This is the bottom card of the deck) What you don't want to face or deal with. Something you are procrastinating or putting off. 2. The 2nd Card - (This card was hidden from view by the bottom card) What is hidden. What you don't see. You aren't necessarily intentionally denying this, you are just blind to it. 3. The 3rd Card - (This card was really hidden!) What is repressed. This card represents something you have purposely shoved down deep in the recesses of your soul. You have swept it under the rug and moved a heavy piece of furniture on top of the rug. 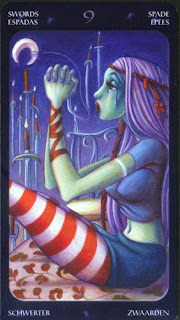 If you uncover a Major Arcana card, it would indicate a weightier issue than the rest. If all three cards are Majors, you've got some heavy furniture lifting to do if you want to sweep out what's under that rug! 1. What I don't want to face or deal with. Laugh! There is something very specific that I have been intentionally procrastinating doing (dealing with a bank issue). Every day, and then every night, I tell myself I'll deal with it the next day. When I saw this card, I knew that's what it was referring to. I'm going nowhere fast on this issue, and I need to take care of it, if for no other reason than to clear it from incessantly popping up in my mind, taking up useful space! Hmmm... Since this is something hidden, it is something I am unaware of. There is mental anguish in this card. I think that if I allowed myself to detach from my usually-optimistic attitude, I would end up in this exact pose. I choose not to dwell on all the ways I wish my life were different, because I don't think that's any way to live. I purposely choose to focus on the good. 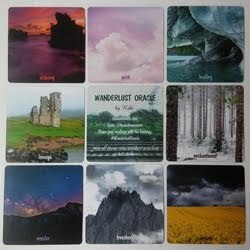 This card tells me that I have hidden fears and anxiety and sorrow that I am not recognizing. The idea of this exercise is to get rid of some of the muck, so instead of keeping this area of my life hidden, I think I need to take a piece of it and work through one of my fears so that it doesn't have to stay hidden any longer. And once I get through one fear, I can work on the next. This card was very enlightening for me. 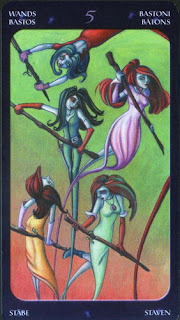 The Five of Wands is about competition, something I have never been comfortable with. I never enjoyed sports as a kid because as a shy, introverted child, I desperately feared not being good enough. Looking at the lovely ladies in this card reminded me of how this insecurity carried over into my relationships, and I tended to have a jealous streak that would burn like fire through my heart. It wasn't something I ever consciously dealt with, so I can see how it came up as a repressed part of myself. Being a mom has transformed me into a much more secure person. I no longer wonder if I'm good enough, or unfairly compare myself to other women. 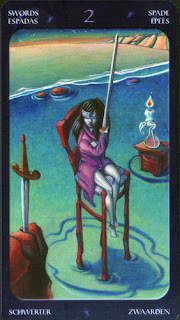 Again, I'll have to give this card more thought, because of all the relationship cards that are coming up for me. Since I haven't been in a relationship in a long time, I wonder how I would approach a partnership differently now that I am more secure with who I am. Maybe this card is indicating that it is something I will need to be aware of... not to allow my insecurity to resurface and rear its ugly head. 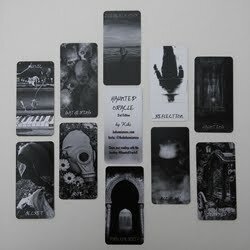 Deck: Tarot of the Sweet Twilight (published by Lo Scarabeo). 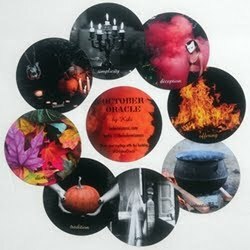 This spread was originally published on my previous blog (Tarot Dame) on 10/17/09.